We really enjoyed reading some books about Fowl this week! Katy Duck is a Caterpillar was a favorite – incorporating movement (Katy is a dancing duck, so I had Jenny “dance” with her), our Fowl Unit, and our Spring Theme. This is a book I definitely would like for our personal library! Duck & Goose was another favorite this week. Duck and Goose is a book about learning to get along and share with your friends. This would make another great addition to our library! 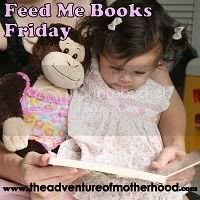 This post is linked to Feed Me Books Friday hosted by The Adventure of Motherhood.